The State Department told CNN that Hillary Clinton has not been sidelined by her broken elbow. WASHINGTON (CNN) - Washington is a town where a sharp elbow is almost a job requirement. The ability to nudge political rivals off-balance and fight for bureaucratic turf can boost a career. So it's easy to understand why the State Department on Thursday was quick to reject any suggestion that Secretary of State Hillary Clinton has been sidelined by her broken elbow. Clinton fell and broke her elbow in the State Department basement as she was walking toward her car June 17, bound for a meeting at the White House. 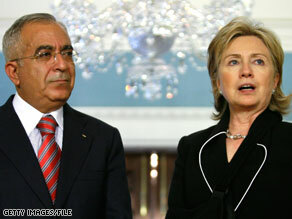 Are Clinton and her international policy responsibilities being usurped by Vice President Biden? "Nonsense," State Department Spokesman Ian Kelly told CNN. Earlier Kelly told his afternoon briefing that Clinton was fully engaged, even if she is spending some of her work-day time at home recuperating and undergoing physical therapy. "Well, I - as I've said earlier, I see the secretary as very engaged, very involved," Kelly said. "She sees the president weekly, talks to him often. She met with him yesterday. But in terms of Vice President Biden's role, I would have to refer you to his office." Vice President Biden arrived in Iraq Thursday. And earlier in the week, White House Press Secretary Robert Gibbs said that Biden would "oversee" Iraq policy and work with both the U.S. military and U.S. Ambassador to Iraq Chris Hill in helping the Iraqis reconcile their political differences. At the outset the State Department portrayed the accident as "a fairly simple, straightforward fracture." On Thursday an official, in a background briefing, said Clinton "shattered" her elbow, suggesting a much more serious injury but providing no details. On Wednesday, the State Department said Clinton was not going to the Moscow summit with President Obama. And that led to a round of reporter questions for Kelly. "Kelly: Well, there were never any firm plans, necessarily, for her to go to Moscow. I think she called Foreign Minister [Sergei] Lavrov yesterday to tell him that she wasn't going to go and she looked forward to seeing him soon. But in terms of what's going to happen in the next few weeks, as I said, she does plan to go to this trip to Asia in a couple weeks, and we hope to have an announcement soon about that. Question: You're still not – you're still not saying why that decision was made for her not to go. Kelly: Well, I think – she broke her elbow and she is getting therapy … So quite naturally, she's focused on that, on healing. Question: Why won't you reveal more medical details? Kelly: Didn't I just say that? Didn't I say that she needs to – she needs to pay attention to her elbow, she needs to – she needs to heal? Question: Is there a possibility of an additional operation? Kelly: I doubt it, but I just don't know. Question: And can you give us any details about the physical therapy? Is it daily? Supervised? Does she go someplace and have it? Kelly. I'm just not aware of it. " After that Kelly seemed grateful when a journalist changed the subject to Afghanistan. And Obama has been kicked below the belt (frontally) by Colin Powell. Just as soon as she finishes her PT she will be able to go on any trip she deems necessary, give her the time she needs and don't start stupid rumors. The writer of this article may be a journalist, but he obviously has never walked through the State Department's underground parking garage which has long been a hazard to life and limb. Of course, Hillary probably shouldn't have been wearing those spike heels at her age, but she just fell down and got a painful and hard to treat injury. Stop trying to make a cesspool out of a molehill. BTW, CNN, you should fire this writer. Why wouldn't Kelly seem grateful to change the subject? Last time I checked, medical records are private. The woman broke her elbow, what CNN/MassMedia do you want to know...how many pills shes taking? How often shes sleeping? What she drinks when she wakes up? Which brand of socks she buys? Please quit trying to make something out of nothing. When did commentary rumors become news? CIVICS! hey, the liberals are now in complete contol now. lets step aside and let them show us howits done. liberals are infamous for blaming everthing on others, it is time to STEP BACK AND LET THEM DO WHAT THEY WANT. THEY SAY THEY HAVE THE ANSWERS AND FOR SURE THEY HAVE COMPLETE CONTOL. Most of the posts here are idiotic. The woman has a serious injury and that all of a sudden means a conflict between she and Obama. Although politicians often play super heroes on tv, they are not. I pray that she will run again in 2012 and that God will give Americans a little bit more brain. John McCain needs to be sentenced for infecting us with the pandemic called Palin. I guess she would have resigned as vice president, if McCain had won the ellection, and things did not go her way. Good bye Palin! Good Riddance! I can't believe that there are still people bitter about the election. Time warp to 2009 people and get a life!!!!!!!!!!!!!!!!!!! I thought we knew what we were getting with Hillary and I voted for her in the primary. Obama is way more conservative than most people want to acknowledge to themselves. Which is why he is disappointing . Although we know better, we keep expecting more radical solutions from him, partly because he keeps leading us to expect them, then giving watered down endorsement-like with healthcare reform and gay rights. We could have accepted the same solutions better from Hillary, but the expectations of what Obama is supposed to accomplish are so unrealistic because we forget he is a smart politician, not super human. Axelrod palyed her like a top. for the formerly smartest woman in the world this admin Axelrod/Emanuel read her hand and played her for a fool. she really is quite dumb and that alleged political operative she is married to end up with the Haiti assignment. the clintons have been had and counted OUT. they made her secretary of state and then farmed out the work to CZARS. just like the russian dynasty, key word in the "NASTY" portion of DY-NASTY. If Hillary runs for president, it will be the DEATH of the democratic party. Wait and see. Obama's first huge mistake was to try to unify the party by giving her big mouth a say in the administration. Both her and her fans, I mean supporters are wishy washy satisfied with nothing bunch of holier than thou elitist. As a yellow dog democrat, I will NEVER EVER vote for her. Never before has a Sec. of State had so little power. Obama is sending different teams to different areas of concern. Now Biden is going to Iraq..I am totally miffed that she is being so dissed. Her talent and intellect is not being used for the mere reason that she would "outshine" the President. Please...we all know the truth. The DNC and fellow politicians threw her under the bus and for heavens sake don't let her have a chance to show SHE not HE would bring peace with other countries. I hope she runs in 2012, I will vote for her again. She wouldn't be flipping on campaign promises they Obama is. I am still trying to give him the benefit of the doubt but with his treatment of Hillary, it is obvious, no one can shine except for him. We are not fooled. Yeah...thank God we got O'bambi.....maybe he can push this nation over the brink with his Health Care Initiative. Payback to Ted....we got a lotta change here....Hillary would have been a leader, not a Follower-in-Chief like we've got. I thought the PUMA people went away. Do you seriously think Clinton is being pushed aside. She is in her 60s and shattered her elbow. Please give it a break. If you hate Obama so much please vote for Palin in 2012. The puma people and Palin deserve each other. Why is dissension in the Democratic ranks a surprise? The only surprise is that it took this long. Obama needed Hillary on the 'team' to win. Now she's expendable. Hillary has my support and vote in anything she wishes to pursue. What the DNC did to her during the primary was disgusting.